Fresh or frozen, breaded or coated with batter, a fish fillet makes for a quick meal. 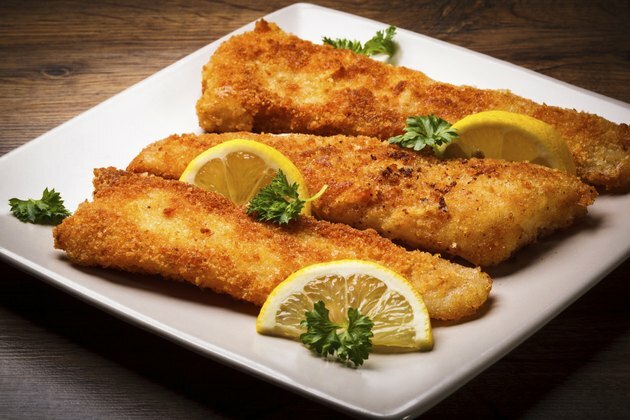 The most common species of fish for filleting is white fish -- cod, sole, sea bass, flounder and haddock -- or any other fish that cooks to a flaky white. Cooking styles for preparing fish fillets are a matter of preference. While grilling and pan-frying are possible, oven baking takes the least effort. Simply pop the fish fillets in, and the oven does the work. Preheat your oven to 425 degrees Fahrenheit. Grease a baking tray or baking dish with cooking spray, butter or olive oil. Arrange individual fish fillets on the baking tray in a single layer. Do not allow the fish fillets to overlap one another. Slide the baking sheet into the oven and cook for 10 to 20 minutes or until golden brown. Test one of the fish fillets with a fork before removing the tray from the oven. If it flakes apart when you break it with the fork, cooking is complete. Drizzle melted butter over the fish fillets 5 minutes before removal to increase flavor. For added taste, add salt, pepper, lemon juice or other seasoning to the fish fillets prior to cooking. Make cleanup a snap by lining the baking tray or baking dish with a piece of aluminum foil. Grease the foil just as you would the bottom of the tray or dish. Do not undercook the fish fillets. If the fish fillets have a rubbery texture during the fork test or resist flaking, continue cooking and test every 10 minutes.